Chestnut African climbing mouse Dendromus mystacalis, photographed by B. Stanley. Contains: Oxymycterus, Phyllotis, Oecomys, Rhipidomys, Aethomys, Niviventer, Notomys, Grammomys, Maxomys, Acomys, Alticola, Lemniscomys, Pseudomys, Mus, Praomys, Apodemus, Rattus, Melomys. The Muridae include the typical Old World rats and mice. Murids ancestrally have non-hypsodont teeth with well-distinct cusps. The largest subgroup, the Murinae, have three files of cusps in the upper teeth, while the African Dendromus usually has only a single internal supplementary cusp in the upper teeth (Lavocat 1978). 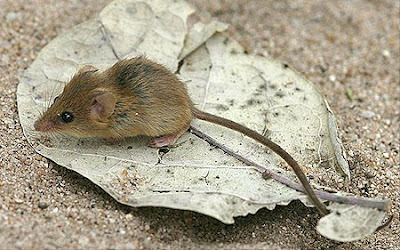 Species of Dendromus, the African climbing mice, have semi-prehensile tails that they use to steady themselves when climbing into low vegetation. The subfamilies Hydromyinae and Pseudomyinae have been recognised for assemblages of rats and mice from the Australo-Papuan region, but are included by some authors in the Murinae. The water rats Hydromys are large amphibious rodents that feed on aquatic invertebrates and small vertebrates. The Hydromyinae also includes the carnivorous Philippine shrew-rats Chrotomys, Celaenomys and Rhynchomys (Musser 1982). [B08] Baynes, A. 2008. The original non-volant land mammal fauna of Faure Island, Shark Bay, Western Australia. Records of the Western Australian Museum Supplement 75: 25-31. [CV02] Cucchi, T., J.-D. Vigne, J.-C. Auffray, P. Croft & E. Peltenburg. 2002. Introduction involontaire de la souris domestique (Mus musculus domesticus) à Chypre dès le Néolithique précéramique ancien (fin IXe et VIIIe millénaires av. J.-C.) Comptes Rendus Palevol 1: 235-241. [GC05] Granjon, L., J.-F. Cosson, E. Quesseveur & B. Sicard. 2005. Population dynamics of the multimammate rat Mastomys huberti in an annually flooded agricultural region of central Mali. Journal of Mammalogy 86 (5): 997-1008. [J68] Johnson, M. L. 1968. Application of blood protein electrophoretic studies to problems in mammalian taxonomy. Systematic Zoology 17 (1): 23-30. [KJ08] Krämer, M. & M. Jentzsch. 2008. Kleinsäuger-Vorkommen aus dem Raum Zeitz—eine vergleichende Studie. Mauritiana 20 (2): 411-427. [L73] Lidicker, W. Z., Jr. 1973. A phenetic analysis of some New Guinea rodents. Systematic Zoology 22 (1): 36-45. [LA02] Long, J., M. Archer, T. Flannery & S. Hand. 2002. Prehistoric Mammals of Australia and New Guinea: One Hundred Million Years of Evolution. University of New South Wales Press: Sydney. [L07] Lunde, D. P. 2007. Vernaya fulva. Mammalian Species 806: 1-3. [M89] Modigliani, E. 1889. Appunti intorno ai mammiferi dell’isola Nias. Annali del Museo Civico di Storia Naturale di Genova, Serie 2a 7: 238-245. [MN02] Moshkin, M. P., E. A. Novikov, I. E. Kolosova, A. V. Surov, A. Y. Telitsina & O. A. Osipova. 2002. Adrenocortical and bioenergetic responses to cold in five species of murine rodent. Journal of Mammalogy 83 (2): 458-466. [M82] Musser, G. G. 1982. Results of the Archbold Expeditions. No. 110. Crunomys and the small-bodied shrew rats native to the Philippine Islands and Sulawesi (Celebes). Bulletin of the American Museum of Natural History 174 (1): 1-95. [MCB06] Muteka, S. P., C. T. Chimimba & N. C. Bennett. 2006. Reproductive seasonality in Aethomys namaquensis (Rodentia: Muridae) from southern Africa. Journal of Mammalogy 87 (1): 67-74. [PYM75] Patton, J. L., S. Y. Yang & P. Myers. 1975. Genetic and morphologic divergence among introduced rat populations (Rattus rattus) of the Galápagos Archipelago, Ecuador. Systematic Zoology 24 (3): 296-310. [PCS05] Percequillo, A. R., A. P. Carmignotto & M. J. de J. Silva. 2005. A new species of Neusticomys (Ichthyomyini, Sigmodontinae) from central Brazilian Amazonia. Journal of Mammalogy 86 (5): 873-880. [PS01] Pickford, M., & B. Senut. 2001. The geological and faunal context of Late Miocene hominid remains from Lukeino, Kenya. Comptes Rendus de L’Academie des Sciences—Series IIA—Earth and Planetary Sciences 332: 145-152. [R14] Revilliod, P. 1914. Les mammifères de la Nouvell-Calédonie et des îles Loyalty. In Nova Caledonia: Forschungen in Neu-Caledonian und auf den Loyalty-Inseln. A. Zoologie vol. 1, Heft IV (F. Sarasin & J. Roux, eds) pp. 341-365, pl. 10. C. W. Kreidels Verlag: Wiesbaden.